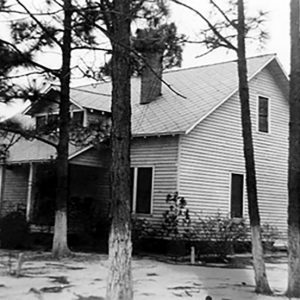 The Great Branch School, which stood here from 1918 to the early 1960s, was one of the first Rosenwald schools in S.C. A two-room frame school built in 1917-18, it was typical of the rural black schools funded in part by the Julius Rosenwald Foundation between 1917 and 1932. A three-room addition and three-room teacherage were built in 1922-23. Principal W.M. Jennings lived here until 1933. The school closed about 1954 and was later burned by arsonists. The teacherage, one of only eight Rosenwald teacherages in S.C., was listed in the National Register of Historic Places in 2007.